I started my driving lessons with Andrew a few weeks ago and I must say it was the best decision I've made. This is THE BEST driving school with best driving instructors. Passsed first time with Keith Gilroy help! Highly recomended!! 83 more than last year ! Welcome to ProTeach, an established driving school operating from Burton upon Trent. We teach in and around Burton, Barton, Lichfield and Derby, also Swadlincote and beyond. We offer excellent instruction with our friendly, reliable and courteous driving instructors. With our range of lessons ranging from £25.00 (on our ten lessons deal), our prices are very competitive too. Our cars are a familiar sight and you can often see them in and around your area on most days. If you’re looking for intensive driving lessons for a fast track driving test pass, we can offer those too. ProTeach can also offer both male and female driving instructors in automatic and manual cars. So if you are looking for a female driving instructor for manual lessons, then call us now to book. We have very limited availability for this service, so give us a ring today to make sure we can fit you in. 2018 was another fantastic record breaking year for ProTeach Driving School. We had 375 driving test passes, that’s 83 more than last year, and again is way more than any other local driving school. We now believe that we have the strongest team of instructors that we’ve ever had. We expect 2019 to be another record breaking year and are in line to achieve over 400 passes. If you are considering learning to drive in 2019 we would recommend you call and book well in advance to ensure your place. If you’re still not sure, why not take a look at our recent passes and customer reviews, you may see someone you know. 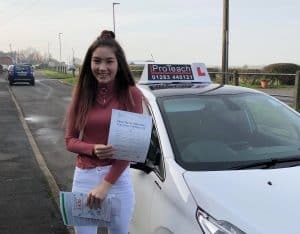 Why choose Proteach when learning to drive? All inclusive, Guaranteed Pass course! Did you pass your driving test after 1st of January 1997 and wish to tow a trailer over 750kg? We will have the training course for you. Our trailer training courses are designed to fit each individuals needs. If you want the best driving instructor- ask for Scott Pitcher. I pass mine with only 2 miners.Highly recommend. Habib was an amazing tutor, taught me everything I needed and more to pass my test. Highly recommended! Highly recommend Simon from proteach! A patient, reliable and fun instructor. Thanks Simon. Our Latest Driving Test Passes..
ProTeach offers quality driving lessons for everyone, of all abilities and ages. 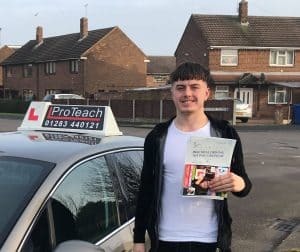 Everyone learns in different ways, but at ProTeach we structure your driving lessons around your specific needs and abilities. Our driving lessons are designed and structured to give you the best chance of passing your test. Fed up with working nine to five? Wanting to be your own boss? Looking for a career that can transform life’s? Looking for value for money training? Become a driving instructor with ProTeach. Intensive driving courses (sometimes called crash courses) are the fastest way possible to learn to drive before taking the official driving test. Offering a fast track method of passing your test, all you need is a provisional UK driving licence, and a strong desire to pass the test.